Ann Taylor has some really great things on sale right now. And then some things are an additional 40% off. They have some really great sweaters. I linked a few that I love above. I really love this sweater/cardigan that I am wearing. I love the leather pockets and it pretty much can go with anything. Also the Nordstrom clearance event is still going on. There is still time to get some great deals! They have so many great things on sale it is hard to choose. Especially shoes and boots! There are so many great pairs to choose from. I hope you all had a great weekend! We had such a fun weekend. Friday we did Maternity pictures. I posted a couple of pictures on Instagram that Matt just quickly took with my phone while the photographer was taking my picture. But yesterday I got to see a real sneak peek from my photographer and I can not wait to share them! They are so much better then I imagined they would be.. I love everything about this look, Jade! The stripes are perfect! Such a great look for fall! Fabulous look! You look chic and polished as usual! Absolutely love the sweater and booties! You look amazing. Can't wait to see the maternity pictures! Such a beautiful outfit!! Your bag and shoes are pure perfection! You look perfect! I bought those same shoes last spring and I love them so much. I also got the leopard pair. They are comfortable and fun. Love this look! 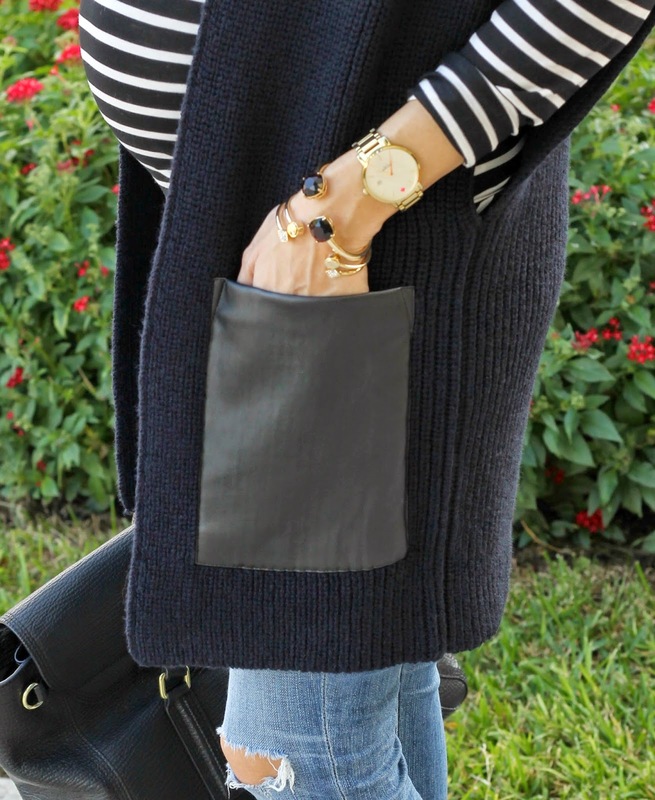 That Ann Taylor sweater is so perfect for this time of year with the contrast in temperatures - lovely! I am needing this sweater in my life - STAT! 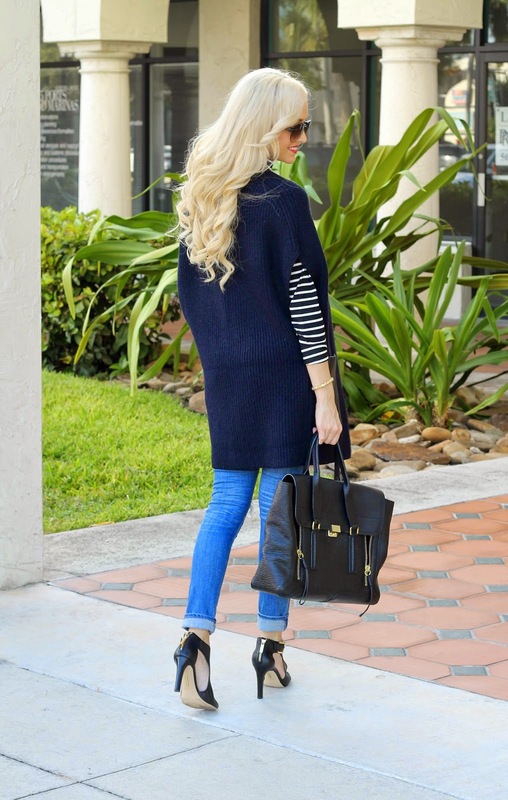 I love the cape style, i've never considered a striped top under it -- but I will now! That shall is so perfect! I love the sleeve shape and the pocket detail! I LOVE your shoes! Sooo cute and wearable in multiple seasons! Stunning outfit! I love your cardie! Ah I literally love everything about this outfit! It's so chic, yet looks super cozy and warm for fall. Love the stripes in combination with the necklace. What wonderful look for that baby bump! Love this look! That sweater has the perfect unique touch with those leather pockets! Love this look, and you look amazing. Congratulations again. Love the vest, and the necklace too. #MadForFashionForLess Follow me on Facebook! Lovely look, those shoes are fantastic!